This is a brief history of how Sam Raimi, Bruce Campbell & Rob Tapert came to know each other, and the other people involved in producing the many Super-8 short films. This information was compiled from various sources, but draws heavily from three books; The Evil Dead Companion by Bill Warren, If Chins Could Kill by Bruce Campbell, and Rushes by Josh Becker. All these books are a must for any Evil Dead fan, and I would highly recommend buying all three of them. Interested in buying the Super-8 Short films that started it all? They're available for the first time officially on DVD, only at Super8Shorts.com. Follow the Super8Shorts.com Facebook Page to keep up with updates. 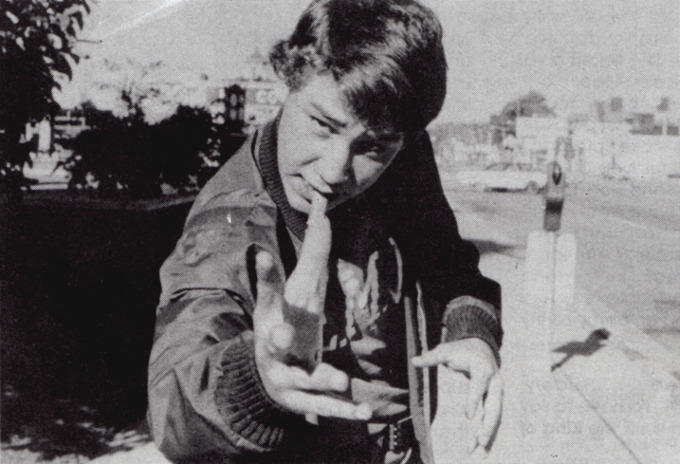 Sam Raimi was born 23 October 1959, in Royal Oak, Michigan. 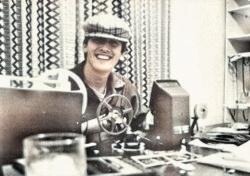 He was first drawn into the movie making world by his father's home movies. It had a powerful effect on Sam to see the manipulation of time on film, and the ability to alter the sequence in which events were shot. He tentatively began to make films of his own, the first one being Out West in 1972. Bruce Campbell, who was born 22 June 1958 (in the same hospital as Sam, the following year). He first became interested in acting around 1966, spurred on by his father's amateur theatrical acting. 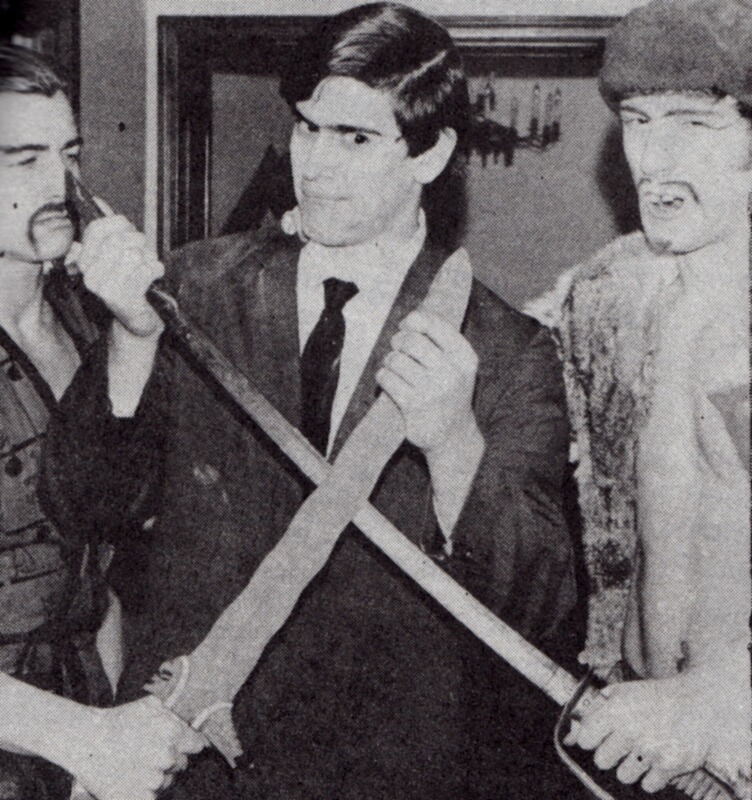 Bruce became involved with the same community theatre group called St Dunstains Guild of Cranbrook, where he worked his way up the acting roles. The theatre provided access to old sets and costumes for later Super-8 productions. A friend of Bruce prior to kindergarten, Mike Ditz had a hand-cranked, Kodak Brownie double 8mm camera, that could not only do simple effects, but it could also produce primitive stop-motion animation. They started making very short movies together, "just little scenes," as Bruce puts it. "One was called D-Day, where I was playing Hitler, Violence was a big thing, for some reason; lots of carnage and mayhem in my early movies. But it was just trickery very primitive and simple; we used dummies a lot, because dummies were cool. You could do a hidden cut and throw a dummy in. It was a good, cool hobby"
"My first brush with Sam was a fleeting memory" says Bruce. "it was in the hallway of West Maple junior High School. Sam was dressed as Sherlock Holmes, playing with dolls in the middle of the hallway and I just walked around him, and headed on down the hall." They wouldn't join creative forces for some time yet. Living not far away in Walnut Lake, Scott Spiegel also attended the same school, and met Bruce in eighth-grade study hall, talking a lot about movies, and their collective love for filmmaking. Scott had a couple of friends that worked with him, so by the time Bruce met him in 1972, Scott was an 8mm veteran, making his first film called Inspector Klutz Saves the Day, in 1969. Scott's buddy, Matt Taylor, had a screening room he had partitioned off in his basement. This highly impressed Bruce "You could barely hear the projector, and they ran these primitive speakers out to where you sat." There, Scott showed Bruce his latest effort, Night in the Sanatorium. Bruce recalls "This wasn't some handheld, out-of-focus piece of crap, it was a real movie with sets they had built themselves and costumes and even stock footage." Prior to this point Bruce's shorts tended more toward serious subject matter, but they began working together, and Bruce gave himself over to Scott's Three Stooges agenda. One of their earliest shorts was 1973's Three Smart Saps, directed by Scott and his friend Bill Ward, in which Bruce appears as a thug. 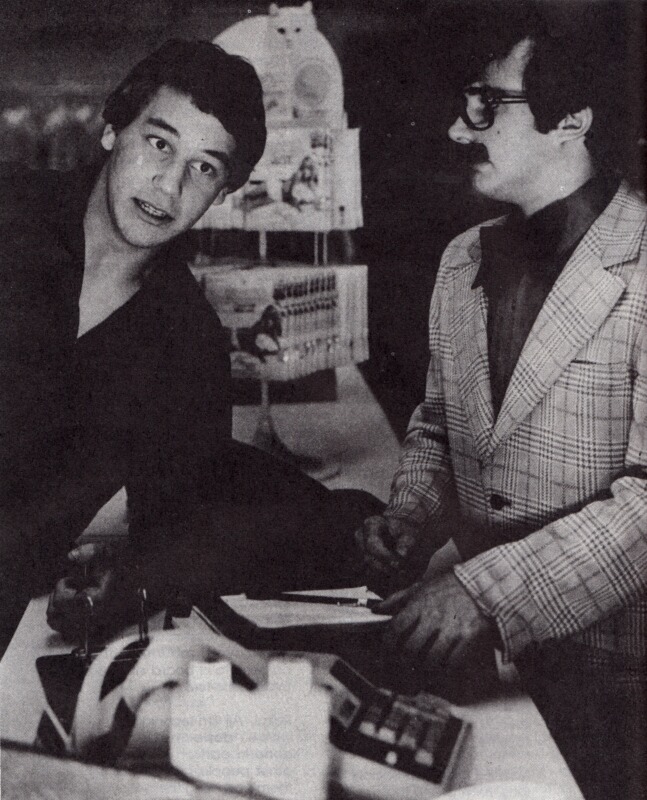 Scott later returned the favour by appearing in Manhunt, a short directed by Bruce in 1974. 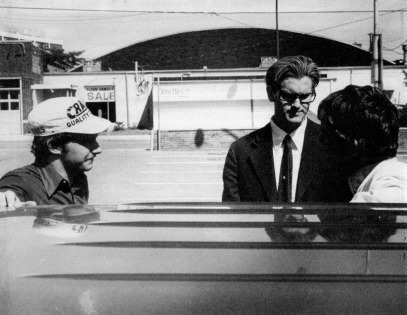 The camera they used didn't record sound so Scott utilized a cassette recorder to record dialogue as they shot. He would keep careful track of the various angles and takes and re-record them in the correct order as close as he could to the final cut of the film. Scott would also record sound effects and backgrounds, many of them off TV broadcasts of Three Stooges films. They would do primitive sound mixes in Scott's basement. He would have two tape recorders set up, one with the original dialogue and the other with all the sound effects he intended to use lined up. The cast would assemble, the projector would roll, and Scott would play the original dialogue tape and add in sound effects where needed. The actors would add in any previously unrecorded extra dialogue lines live, and all of this was recorded onto a new tape giving in a crude but effective complete sound mix. 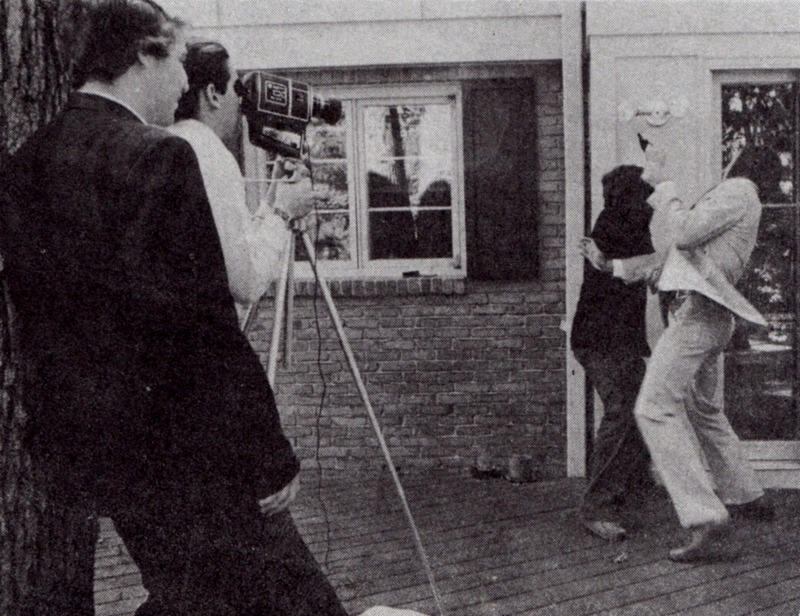 They had a constant battle with audio sync, so Scott made marks along the edges of the film that only he could see during a presentation so that he could tell how out of sync the cassette playback was, then he would adjust the speed of his Varispeed projector to correct the sync, and occasionally would have to quickly fast-forward or rewind the tape. Their audio sync issues were fixed when they moved from standard 8mm film up to Super-8 film, which was available with a magnetic sound stripe, so they could record picture & sound simultaneously as they shot. 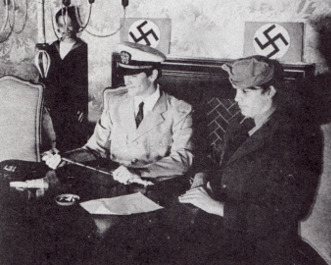 With the aid of a sound-on-sound projector, they were able to dub over the existing soundtrack on the film, although this was somewhat of a one-shot deal and could ruin their original on-set audio recording, so they then had to re-dub the lines in sync, but with the following generation of projectors they could not only record on the main magnetic audio stripe, but also on the balance stripe on the opposite side of the film stock. This allowed easy recording of music and sound effects by using the balance stripe as a second track, without the risk of destroying the originally recorded synced sound. Bruce sat behind Josh Becker in study hall, a massive movie fan. Josh and Bruce both got parts in the eighth-grade play; The Lottery, although Josh did get the better role because he could grow a full beard. In a school project, Josh filmed an adaptation of a play called Oedipus Rex in 8mm. Mike Ditz photographed it and Bruce played King Creon. Josh was impressed because Bruce brought his own embroidered toga. At the end of ninth grade the students were allowed to have elective classes for the last six weeks of school. Josh chose movie class, while Bruce took the history of sports instead. Josh's next ambitious production was called Super Student. It was screened for the entire school in the auditorium. Bruce and Sam both saw this and were very impressed. As a side note, When Bruce enquired as to why Josh hadn't asked him to appear in it, he replied asking Bruce why he hadn't taken movie class? Bruce finally met Sam in drama class at Wylie E. Groves high school in 1975, during a pantomime assignment. Every summer when most of the Super-8 films were made, Sam was shipped off to Camp Tamakwa in Ontario, so was slow to get involved with the forming team. Around the same time, Sam met Scott Spiegel in high school biology, but they didn't become friends right away. Sam asked him for Moe Howard's address (of the Three Stooges) and he wouldn't give it to him. Eventually, Scott coughed up the address and Sam joined this expanding group. His first role was a thug in No Doughboys. "It was good doing the Three Stooges rip-offs," says Scott, "but when Sam came into the fold, we were doing things like The James R. Hoffa Story". Bruce and Sam met John Cameron relatively late-in high school home room, introduced by their mutual friend Mike Ditz. He wound up specializing in ill-tempered customers in their early Super-8s. Eventually, Sam, Josh, John, Mike and Bruce all merged with the Spiegel camp. Between them, they now had cameras, projectors, editing equipment and lights. Everything they needed to produce more professional productions. They formed the Metropolitan Film Group and even issued business cards. 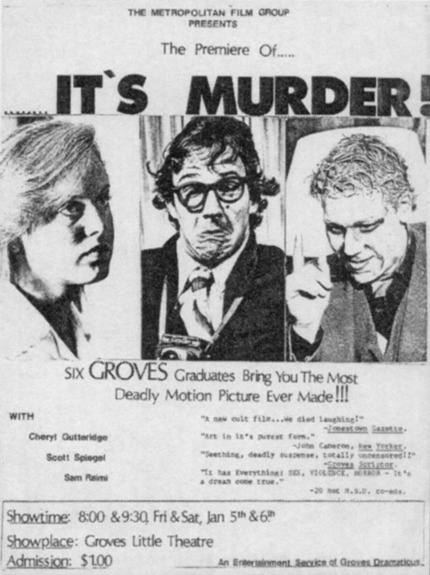 Most of their films were made with the same people; Sam, Scott, Bruce, Josh John, and Mike, shooting in and around Birmingham, the suburb of Detroit where Wylie E. Groves High School was located. Sam recalls "we'd all pitch in directing, we'd all pitch in acting and paying for the films. It was a very communal experience - everyone did everything, And its weird, I don't think it was a conscious decision, but eventually Bruce turned out to be the better of the actors, he had the handsome jaw and the good looking face, so we found out that girls liked watching him. So he became the actor and I ended up behind the camera, but we just kind of fell into those roles." Spiegel had a job at the Walnut Lake Market in West Bloomfield, Michigan, off and on for around twelve years. Scott could get boxes, pies, any kinds of food, stuff that technically couldn't be sold any more, but would still look good on screen. They used this resource to the full in many Super-8 shorts. 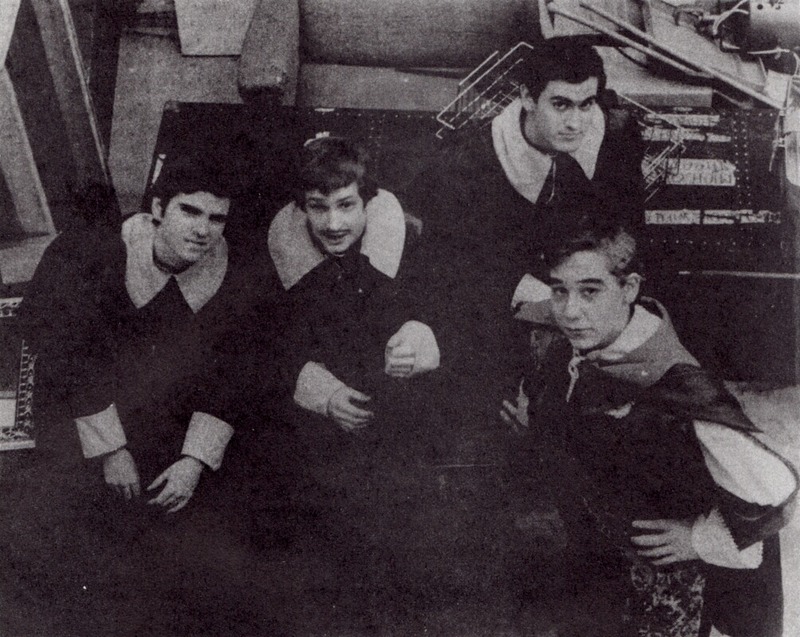 The group finished high school in 1976, and Bruce was determined to become an actor. He successfully applied to the Cherry County Playhouse up in Travers City in northern Michigan for an unpaid summer job. Once he returned home in the fall, and after a short stint in college, Bruce got a job as a production assistant with a local advertising executive, Vern Nobles, through his father in January of 1977 and stayed on for about a year. Vern taught Bruce the basics of film making, such as screen direction and editing. The group continued making shorts, and with Vern's advice, their films became slicker and more professional. Their ambitions grew, as did the budgets. The average film cost of around a hundred bucks soon ballooned to four or five hundred. Eventually, a question began to loom in their minds: could they actually make money with these things? Sam then depated for Michigan State University. Rather than filmmaking he studied literature which was something his father steered him to "...so that when you finally make pictures, you have something to bring to it.". This meant their super-8 short filmmaking became far less frequent. Ivan Raimi, Sam's brother, was already at MSU. His room-mate was Robert Tapert, whose major at the time was economics. 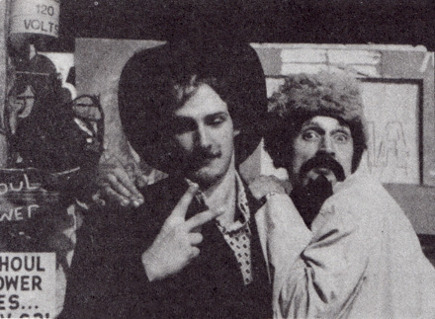 Rob and Sam became friends, and Rob was drawn into Sam's film making world, taking the title role in The Happy Valley Kid made in 1977 for $700. The finished short was shown on campus and was a big success grossing around $5,600. They assumed that a bigger film would do even better, which lead them on to make It's Murder! the following year. It's Murder! was 'released' at MSU that winter to great fanfare, with expensive ads in The State News. Things did not go to plan. Financially, it was a disaster and Sam was discouraged, but Rob still felt that they could make a successful feature film. The fact that the 'scare' in It's Murder! was the one thing that did work, gave them the idea that horror was the way to go.